Basically, each piece of foodservice equipment you purchase should be made from materials that will optimize that piece of equipment's ability to do its job. As such, there are a handful of properties to consider. SHOULD EQUIPMENT BE HARD OR FLEXIBLE? It depends on the application, of course. In many cases, it needs to be a balance of both. As an example, a knife might be the perfect tool for buttering bread, but why? It includes some flexibility, meaning it won't break if pressure is applied. On the other hand, if a knife is too flexible, it can easily bend out of shape and not return to its original form when pressure is applied. This same principle can be applied to steam table pans or buffet line cabinets as it relates to denting. As we talked about before, the hardness of a piece of stainless steel is largely dependent on the amount of carbon that is added to the formula. If it contains a high percentage of carbon, it will be a stronger, harder grade of stainless steel. At the same time, too much carbon can make stainless steel more brittle, breakable, and harder to form. Nickel provides different properties. If stainless steel has lower nickel quantities, it will be harder. If it has a higher percentage of nickel, it will be softer and easier to form. 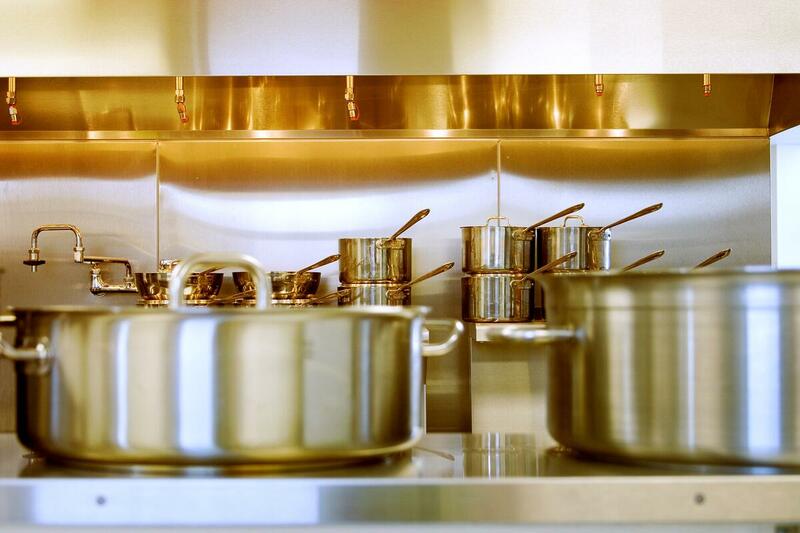 As a baseline, 304-grade stainless steel for foodservice equipment has eight percent nickel. Manufacturers have found, though, that six percent nickel in 301-grade allows for enough malleability to form items such as cookware. Manganese is also sometimes used as a substitute for nickel, but the bottom line is if foodservice equipment manufacturers cut back on their nickel percentages too much without substituting it with a similar element, their stainless steel might be pushed to the brink, leading to equipment more prone to cracking. WHAT DOES IT MEAN TO BE DURABLE? Day after day, month after month, year after year -- foodservice equipment has to withstand the test of time in order to be durable. Even though something might hold up in the short term, that doesn't mean it will last long term. If a piece of equipment doesn't have enough nickel, for example, it can slowly crack or degrade over time. Corrosion is an important factor here. Whether it's automatic dishwashing or acidic foods like vinegars, the result can be corrosion when it comes to stainless steel. How can manufacturers avoid corrosion? With chromium. Chromium is the "stainless" part of stainless steel. Though no stainless steel is 100 percent corrosion free, those with higher percentages of chromium have more protection against corrosion. By creating a protective layer on the surface of the steel, the layers underneath are protected. The problems occur when those outer layers are scratched, exposing the steel underneath. And this is where nickel comes back into the equation. Nickel not only has corrosion-resistant properties of its own, but it also helps re-form the chromium passivation layer more quickly if the surface of the steel gets scratched. This is essential in, for example, a steamtable pan that may regularly be exposed to corrosive foods such as tomatoes, mustard, or sauerkraut. While pan B (on the right) may have had a smaller purchase price, it will need to be replaced far quicker than a pan with the more appropriate amount of Chromium. This is not to mention its lack of NSF certification and possible dangers it presents to your customers. WHAT ABOUT MAKING EQUIPMENT LOOK NICE? We live in an era where the back of the house is becoming more and more transparent to the front of the house. Open kitchens, self-serve, and restaurants the employ serving lines are more common now then they ever have been in the past. Stainless steel foodservice equipment is a large part of this equation when it comes to creating spaces that are still aesthetically pleasing. Mirror-finished stainless steel looks sleek, and it will require a higher amount of nickel. If it's the mirrored, reflective look that's desired, compare different grades of stainless steel side by side along with their different nickel percentages. Chromium is also important. Though a unit might look bright and shiny in the beginning, if it doesn't have enough chromium content, that mirrored look might quickly turn to corrosion, pitting, or stains. This is when cleaning and care can make an impact. To learn more about stainless steel, including how to clean and care for it, stay tuned for part three of our series on stainless steel. Or you can talk with one of our experts about which grades of stainless steel are right for your applications.